CF® Dye Annexin V Conjugates can be used to stain the surface of apoptotic cells. The human anticoagulant Annexin V is a 35-36 kDa calcium-dependent phospholipid-binding protein with high affinity for phosphatidylserine (PS). In normal viable cells, PS is located on the inner leaflet of the cytoplasmic membrane. In apoptotic cells, however, PS is translocated from the inner to the outer leaflet of the plasma membrane, where it can be detected by fluorescently labeled Annexin V. Biotium’s CF® Dyes are next-generation fluorescent dyes with advantages in brightness, photostability, and water solubility. 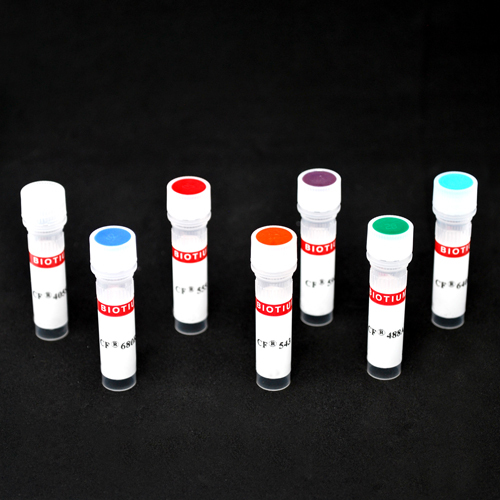 Annexin V conjugates typically are supplied as stock solutions with azide as a preservative for end-point staining assays in Annexin V binding buffer. Our azide-free CF® Dye Annexin V Conjugates are supplied as lyophilized solids with no azide or other preservatives that might be incompatible with live cell imaging. After reconstitution in buffer, the conjugates can be added to cell culture medium for cell staining. We also offer Near-IR CF® Dye Annexin V Conjugates, preservative-free and lyophilized, compatible with small animal in vivo imaging. Annexin V Conjugate solutions (with azide) also are available with a large selection of CF® Dyes, biotin, R-PE, APC, and other labels. Our Mini Syringe Filters are convenient for small volume sterile filtration of azide-free Annexin V stock solutions or other aqueous solutions for live cell imaging. Sterile 0.22 um filters are useful for filtering 100 uL to 1 mL of aqueous solutions with only 10 uL hold-up volume. Ultra-low protein binding, suitable for filtering our azide-free Annexin V and other solutions for live cell imaging.